Enjoy this new and unique short break, which gives the opportunity to experience traditional Yorkshire hospitality and see spectacular Yorkshire scenery. Our base is Skipton, Gateway to the Dales. SKIPTON CASTLE AND CANAL CRUISE: Enjoy the 'War of the Roses' guided tour of the 900 year old Skipton Castle, followed by an award winning pork pie lunch. After, visit Skipton Museum or browse the shops before enjoying a relaxing two hour cruise along the Leeds Liverpool Canal. YORKSHIRE DALES, BOLTON ABBEY AND STEAM TRAIN: We discover some of Yorkshire's heritage and history, with a ride on the Embsay and Bolton abbey Steam Railway, and visit Bolton Abbey itself, best known for its Priory ruins. After lunch we see more of the beautiful Yorkshire Dales. 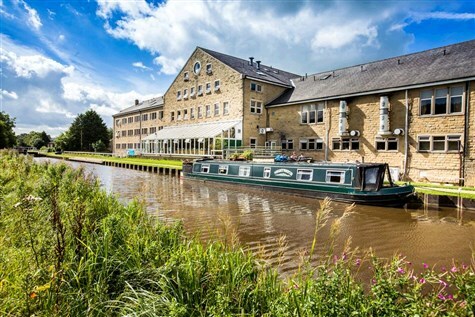 Enjoying a lovely location alongside the Leeds Liverpool Canal, just one mile from the town centre. All ensuite rooms have TV and hospitality tray. There is a bar, lounge, restaurant overlooking the canal and leisure club including pool, spa pool, sauna, steam room and gym. The hotel has a lift.